Kitchens across the nation continue to evolve from the functional cookie-cutter space to a creative, unique, and inspiring one. Kitchen cabinets play an important role in the aesthetic changeover of kitchens because they are no longer just for extra storage — but style, as well. In our most recent blog, we covered five popular kitchen cabinet designs that we’ve noticed trending in homes, not only in Barbados, but across the nation! 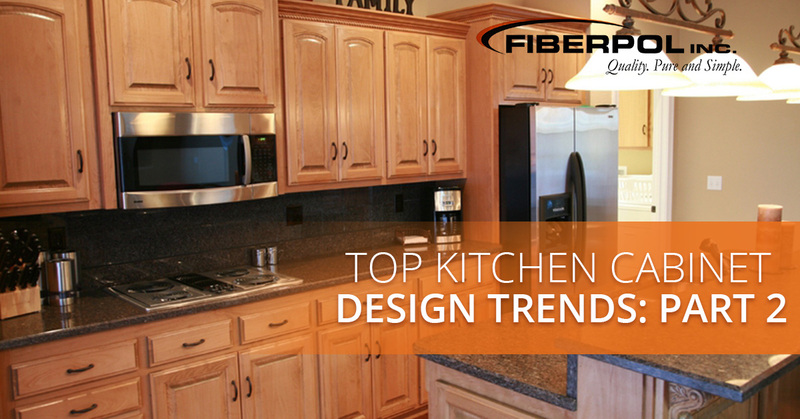 Check out five more popular trends among kitchen cabinetry, and when you’re ready to upgrade your kitchen cabinets, contact the professionals at Fiberpol Inc. for a free consultation! In part one of this blog, we mentioned how the clean and simple look of kitchen cabinets is on the uprising. One of the most recognizable trends of cabinetry has been the adoption of simple aesthetics. We expect this minimalist trend to continue for years to come. Most modern cabinets do not boast the ornate style that was inspired by the late 17th and 18th centuries and is featured on most cabinets in old houses. Today, you can find kitchen cabinetry that features a recessed panel door and simple edging to create the simplest design style. Minimalist and simple cabinetry complements modern-styled kitchens excellently, pairing well with countertops and flooring. Homeowners with modern and contemporary kitchen designs may have kitchen appliances integrated into their kitchen cabinetry. Check out some of the benefits of this popular trend. Having appliances integrated into your kitchen cabinets ensures that your kitchen is efficient in its use of space. Integrated appliances feature a smooth transition from appliances to cabinets and create a very appealing look. If you’re not a fan of gaps between kitchen appliances and cabinets, then this style may be perfect for you! We have all been there. We’ve all experienced a specific kitchen feature that made us embarrassed to have company over. For example, maybe you don’t like seeing your refrigerator doors, having an integrated feature would allow you to hide it within your cabinetry. In addition to a fridge, you can hide other appliances inside your cabinets instead of having them stand out! Cabinets made of oak wood were extremely popular in the 1970s and continued to ride the wave well into the early 90’s. Although they seemed to disappear for a while, oak wood cabinets have started to make their way into kitchens. Oak cabinets are appealing to homeowners due to the dimension and texture that can be used in an area that is full of polished and reflective surfaces, like the ones in a kitchen. This style of cabinets can create a blending balance with other components of the kitchen while giving off a natural element feel. Many cabinet manufacturers are designing a variety of door styles using oak wood, like recessed panels. Oak offers beauty with its natural color but can be bold and unique with a coat of colored paint. Many people are used to the generic 90 degree-hinged wall door on their cabinets, as it has been the most common trend for years. Today, however, cabinets are featuring different styles of doors to add efficiency and uniqueness. The most popular doors that we have noticed besides the traditional are flip and sliding doors. Check out a brief overview of the two. Kitchens specifically seem to be getting more and more high-tech. From refrigerators that update you with the weather forecast to appliances that can hook up to your smartphone, homeowners and families have never been more connected to their kitchen. Today, it isn’t uncommon to have kitchens designed to meet our electronics and device’s needs. To be considered high tech, at a basic level, kitchen cabinets should feature a changing station for mobile and personal devices. If you’re someone who loves using your phone or tablet to look up recipes and cooking videos, installing a dock station may be beneficial. Some homeowners even have wireless devices, like music speakers, built right into their kitchen cabinets. Kitchen cabinetry has evolved into a more modern and unique style over the past years. Many homeowners are upgrading their kitchens and old cabinets to follow current trends. 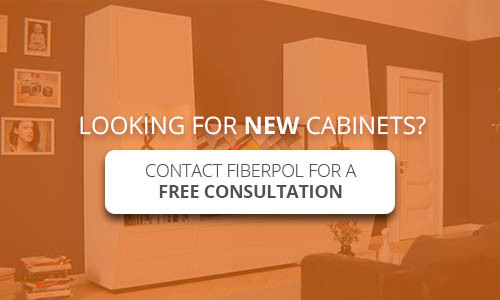 If you are interested in getting new cabinets for your kitchen, contact the team at Fiberpol! Our professionals can walk you through numerous cabinet designs and styles and offer cabinet installation. For more information about kitchen cabinets or remodeling services, contact Fiberpol for a free consultation.